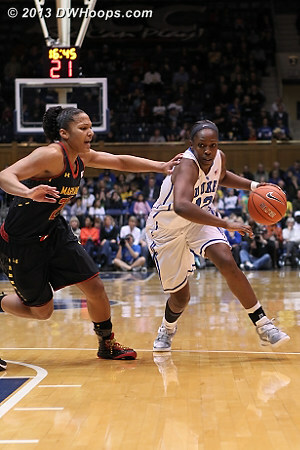 All photos are published - over 100 public photos and 100 more member photos makes our biggest gallery of the season! 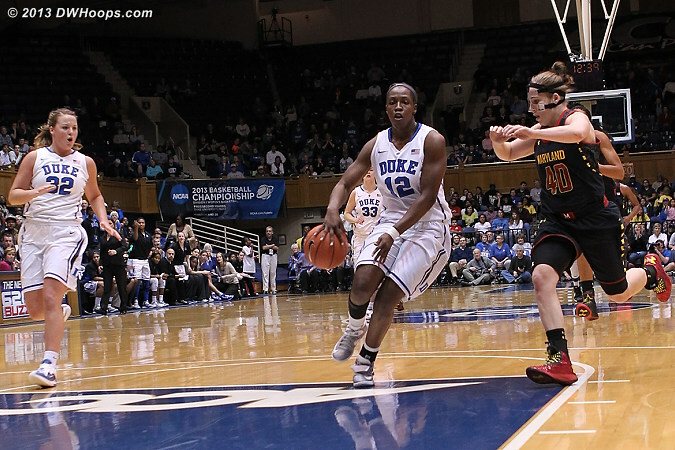 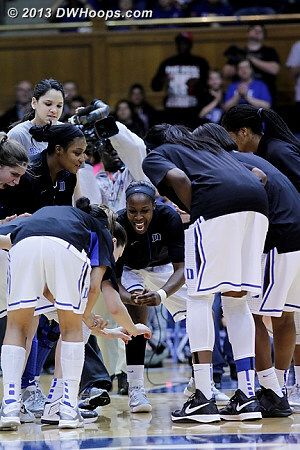 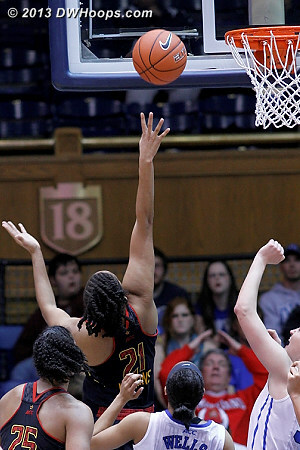 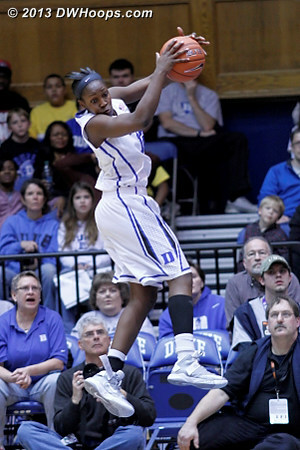 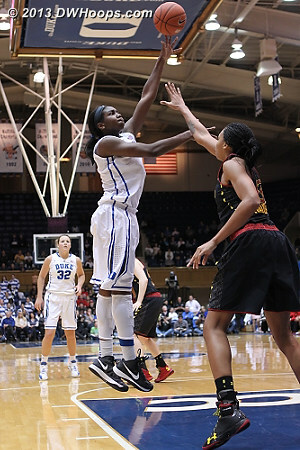 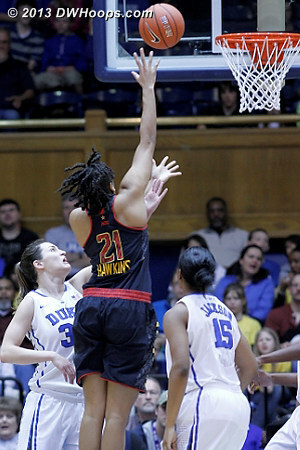 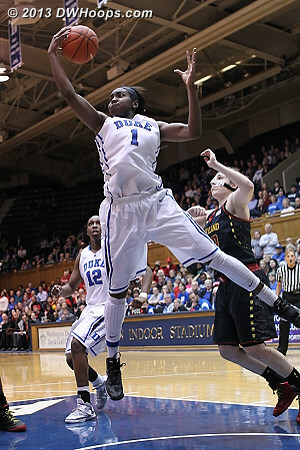 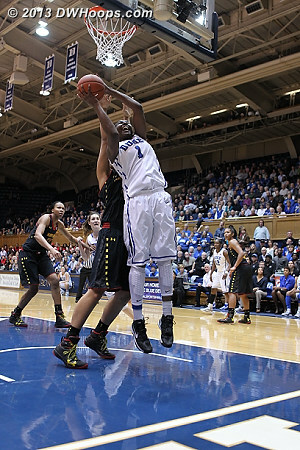 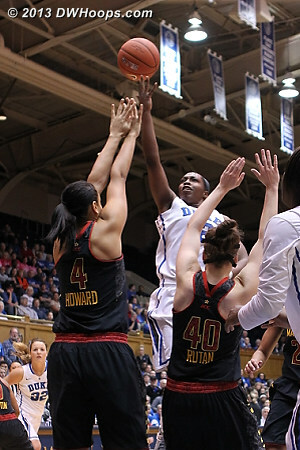 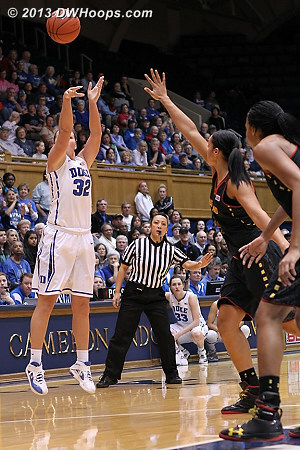 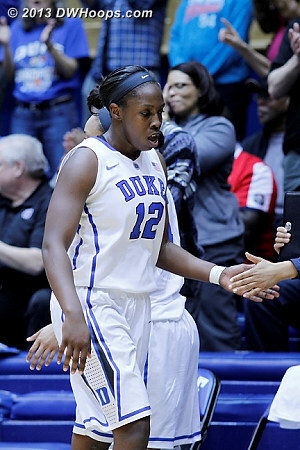 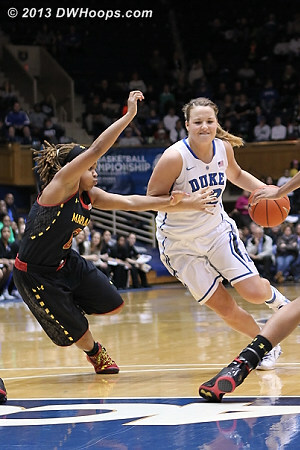 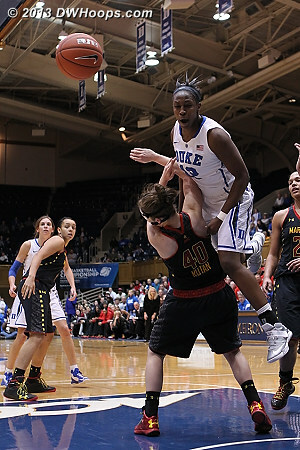 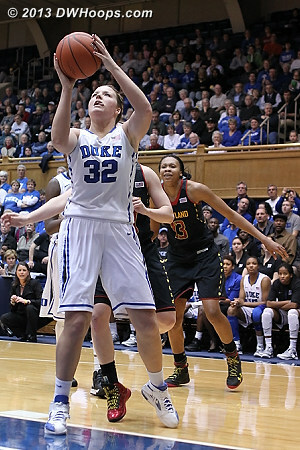 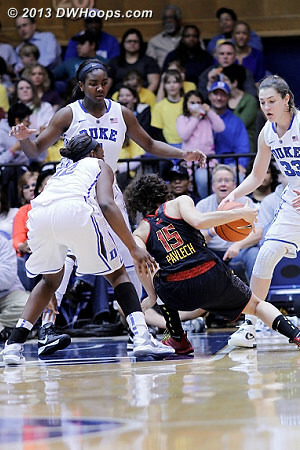 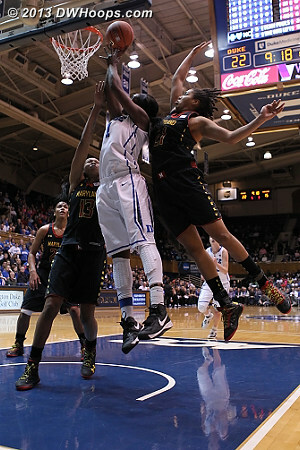 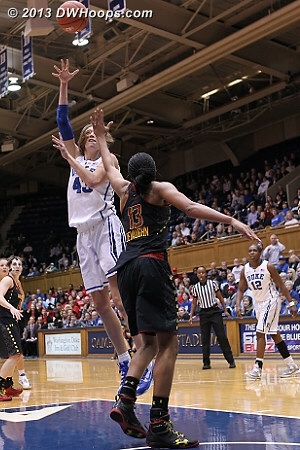 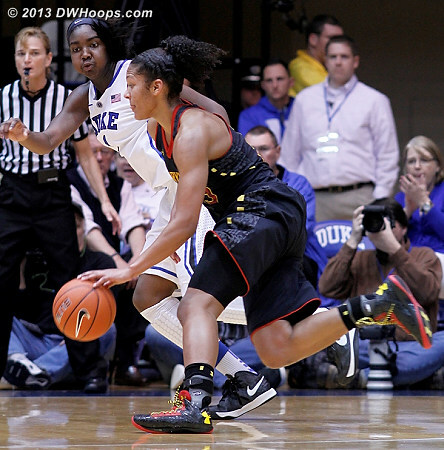 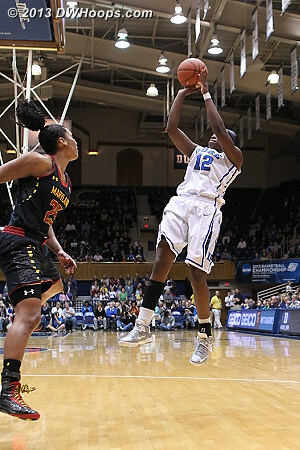 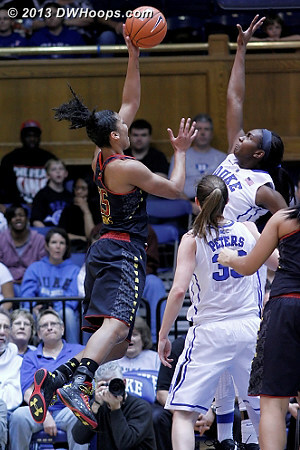 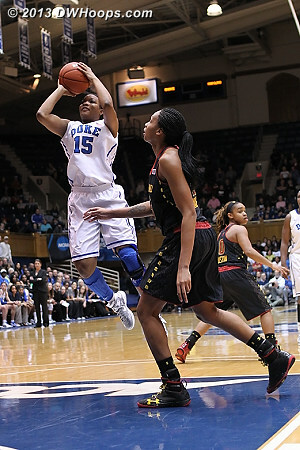 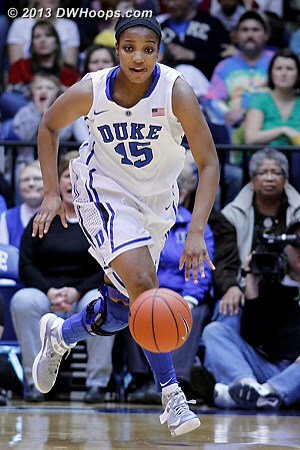 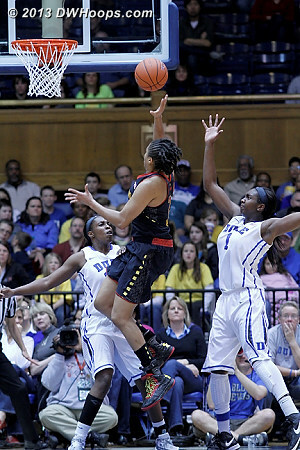 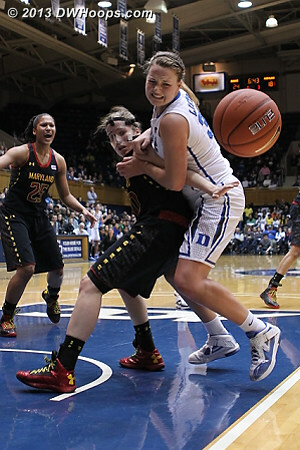 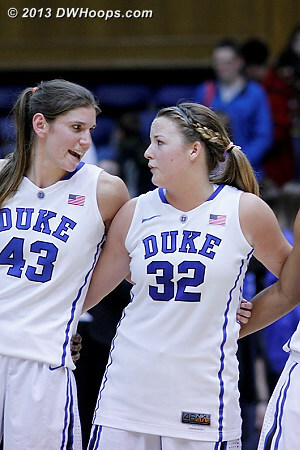 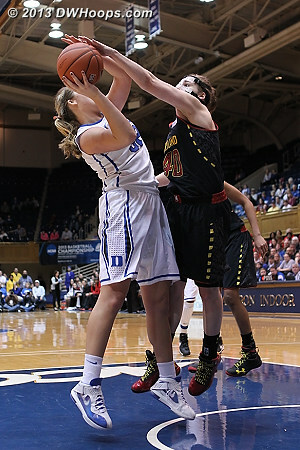 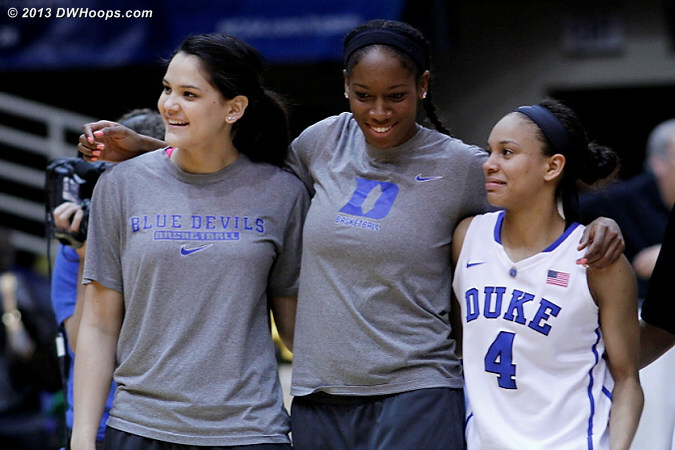 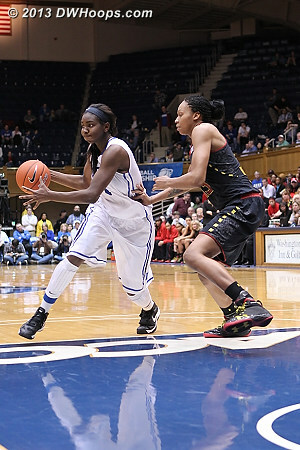 Alyssa Thomas avoids the Elizabeth Williams block to score, and it's a 13-9 Duke lead at the first media time out. 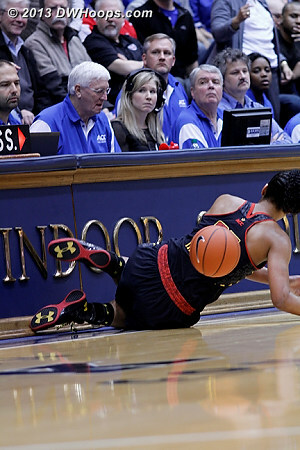 The ball went out of bounds apparently off Maryland's Austin and then Thomas, but it was awarded to the Terps. 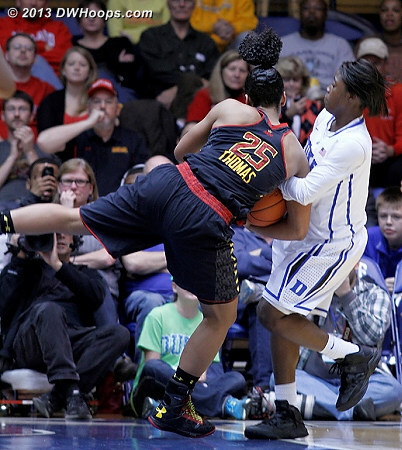 If it was a "make-up call" for the previous miscue, that's fine by me. 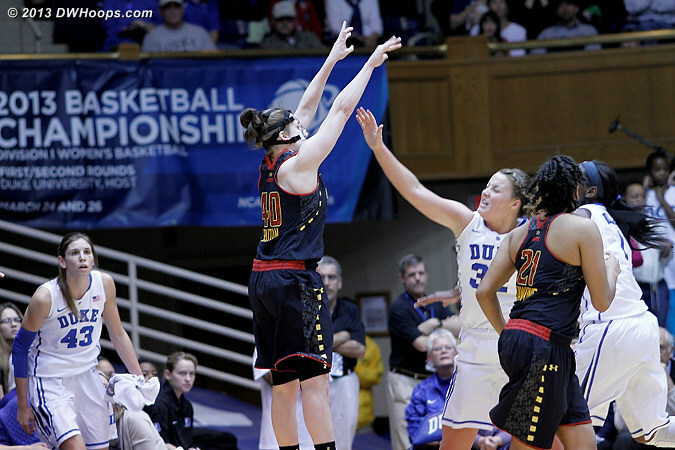 Katie Rutan gets an open look from three. 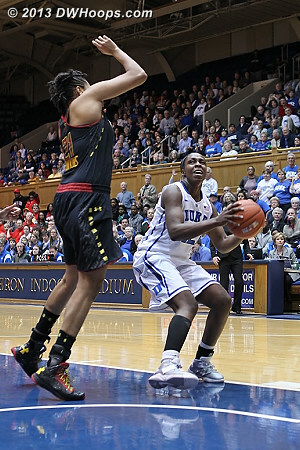 Between the 15:04 mark and the 4:22 mark, Maryland's only points came from behind the arc. 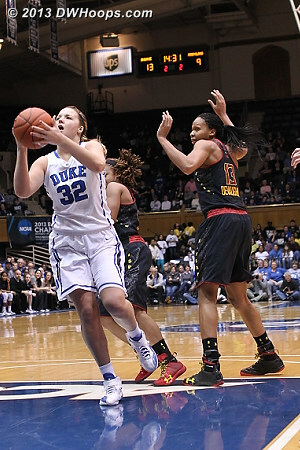 Tianna Hawkins and Haley Peters largely neutralized each other, combining for 8 turnovers and 7 fouls. 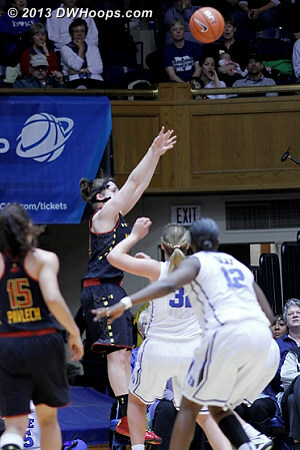 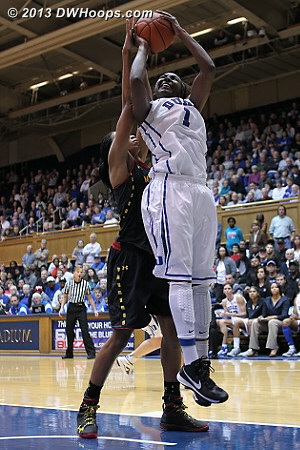 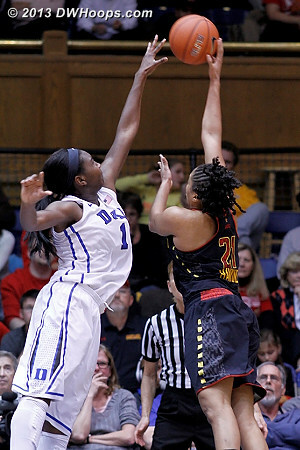 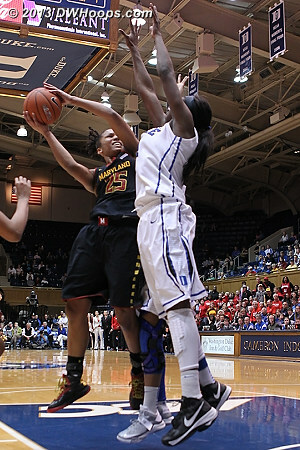 Hawkins scored six on 3-11 shooting (including this miss) while Peters was shut out in just two attempts. 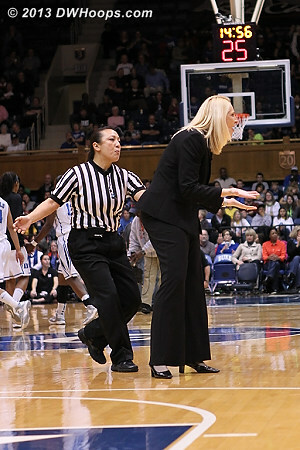 Neither player went to the line. 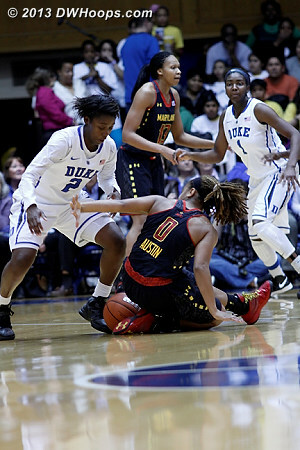 Jackson rebounded her own miss, but lost control and charged into Rutan. 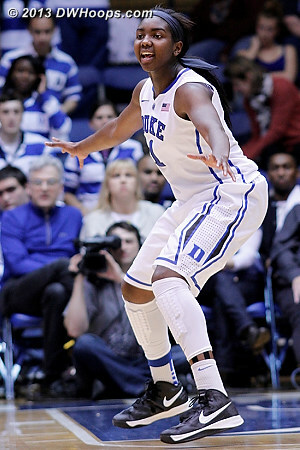 If her knee is truly better then it's not trusted. 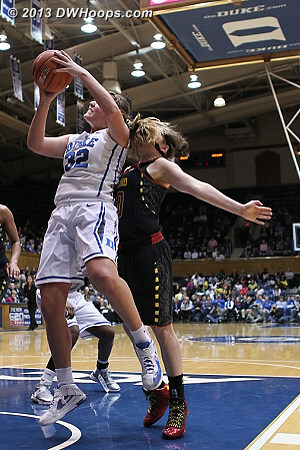 A physical game like this demands a good "cut man" - here's Megan Rogers getting the job done. 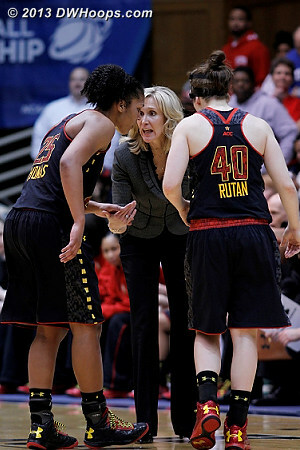 If she's busy now, just wait for the Big Ten. 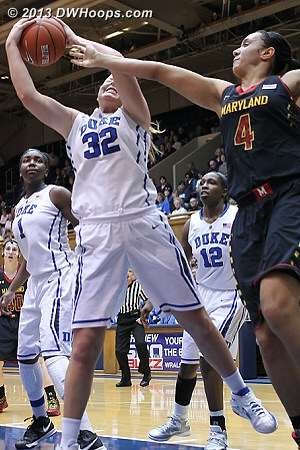 Rutan again keeps Maryland in the game with a timely three. 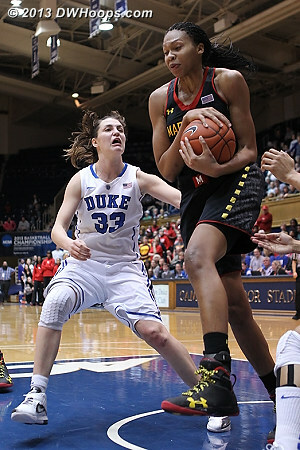 Terps trail 24-18. 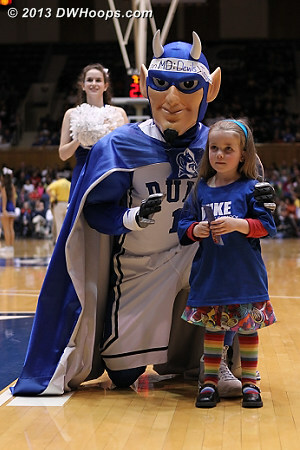 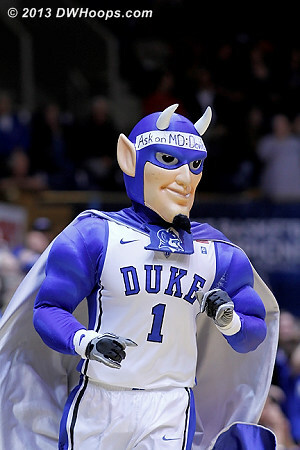 A NOSH certificate winner with the Blue Devil. 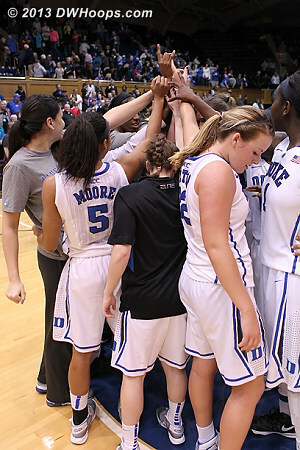 We thank NOSH for their sponsorship of DWHoops this season! 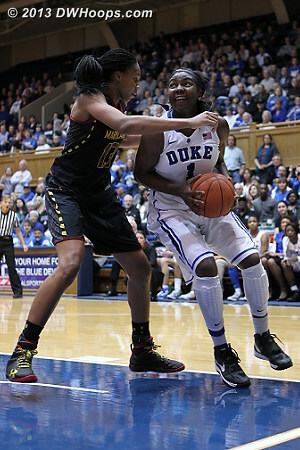 Chelsea Gray draws a charge - "When Tianna Hawkins ran into my chest it hurt really bad but I knew I had to get up, there was still more game to play." 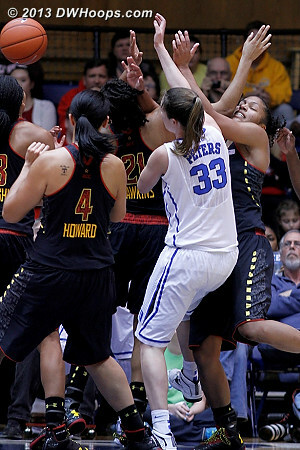 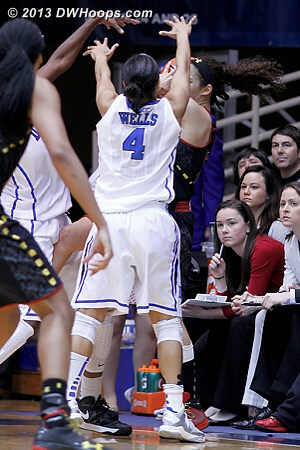 Alyssa Thomas' hand on the back of Chelsea Gray is just enough for the foul to be called with five seconds left. 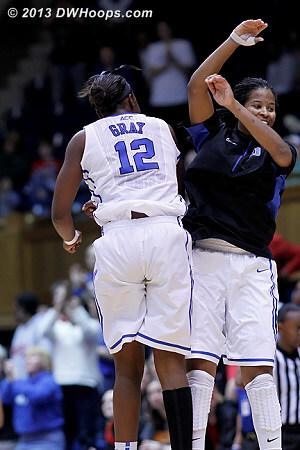 Gray made one to give Duke a 31-28 lead at the break. 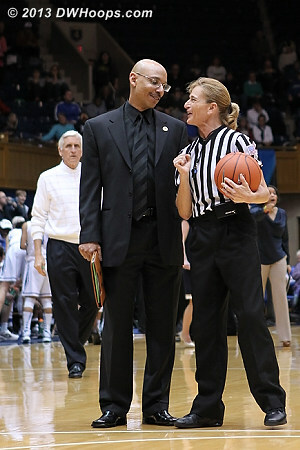 Thomas can't believe the call, and that's the end of the first half. 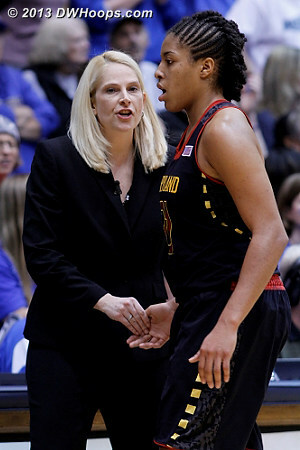 Chloe Pavlech and Dee Kantner share a moment before the start of the second half. 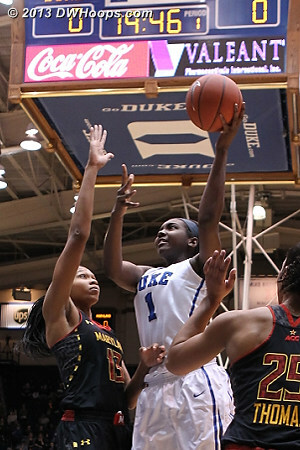 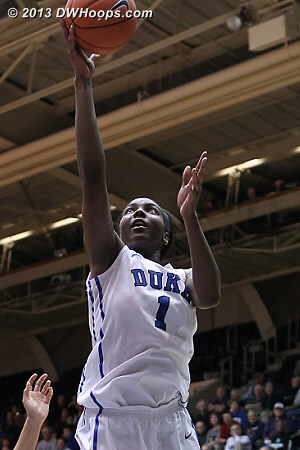 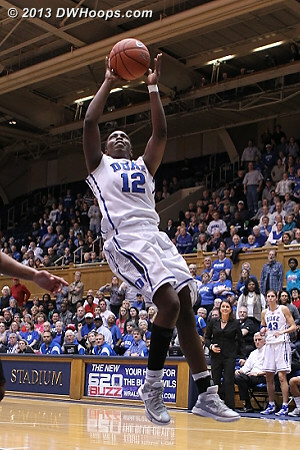 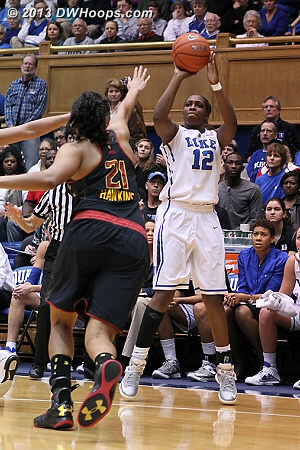 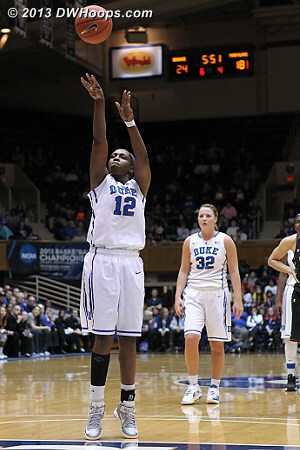 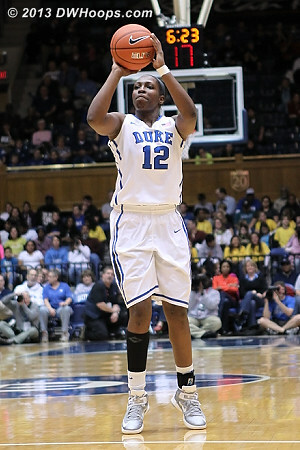 A cold-blooded three from Chelsea Gray puts Duke back in the lead to stay. 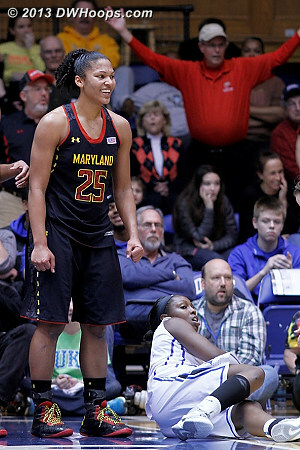 The Terps led for about two minutes. 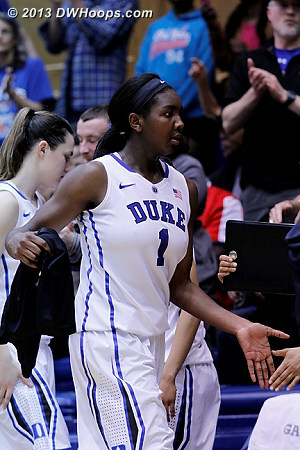 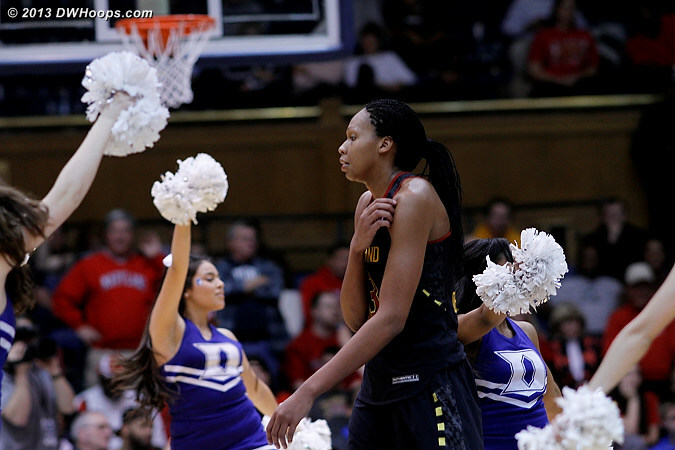 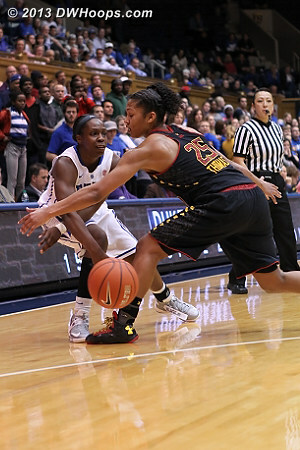 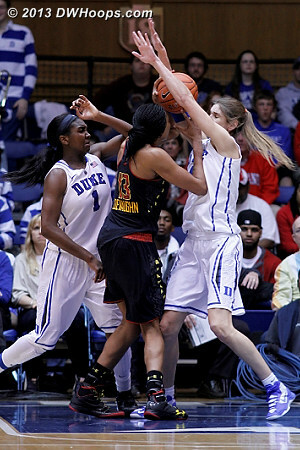 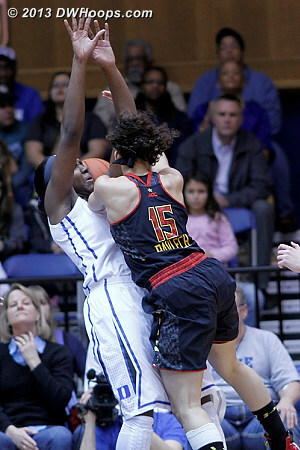 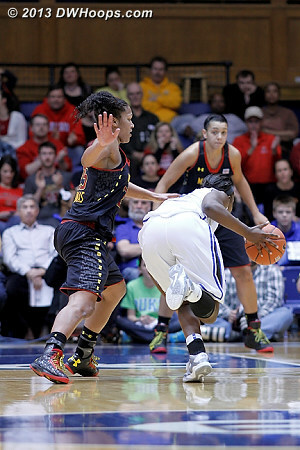 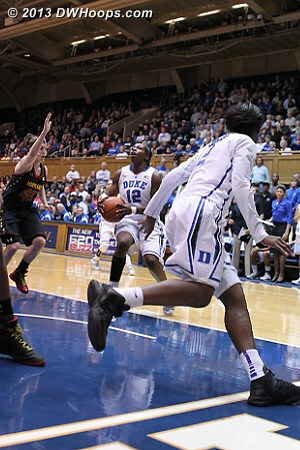 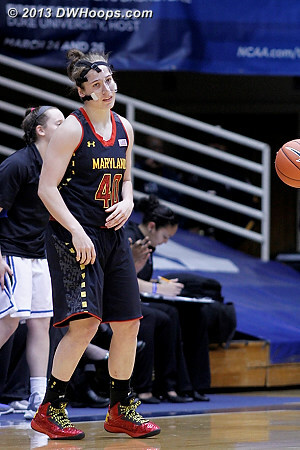 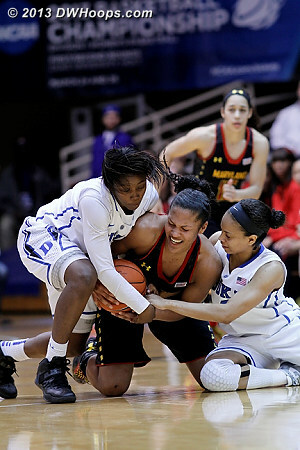 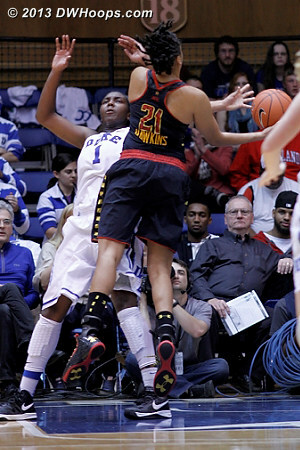 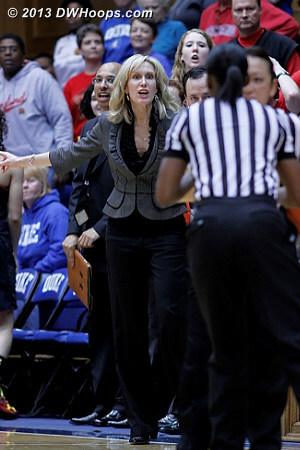 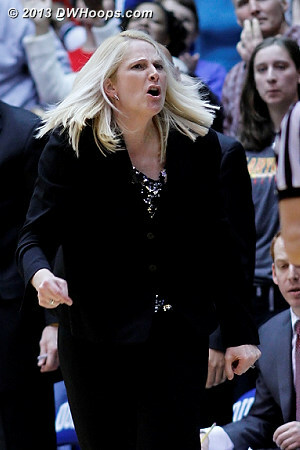 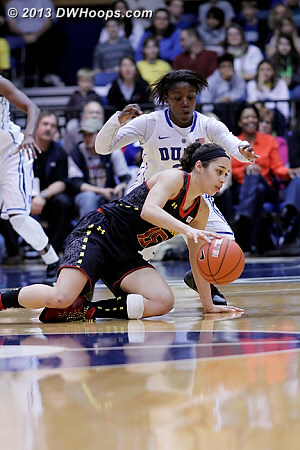 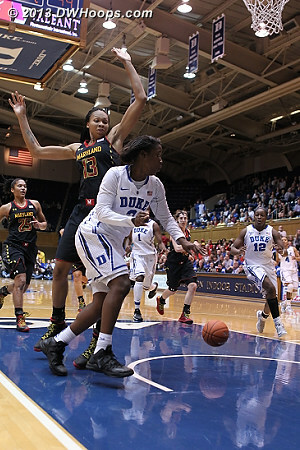 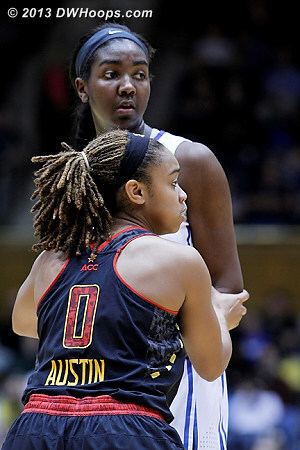 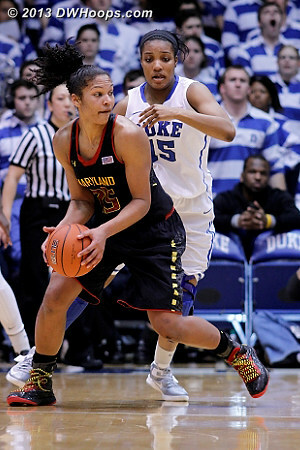 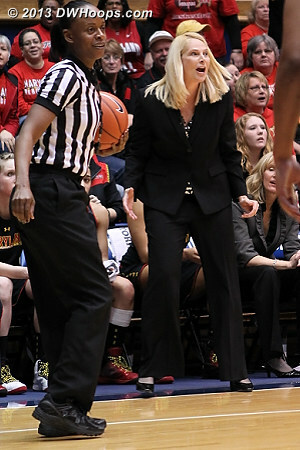 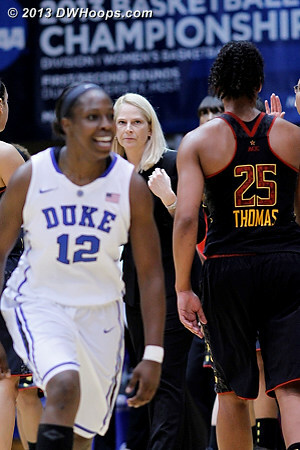 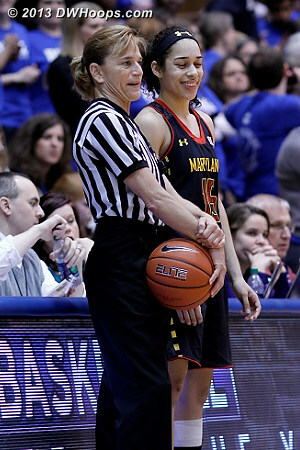 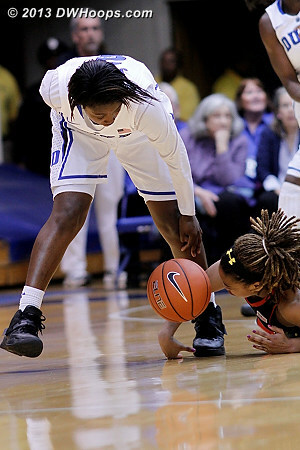 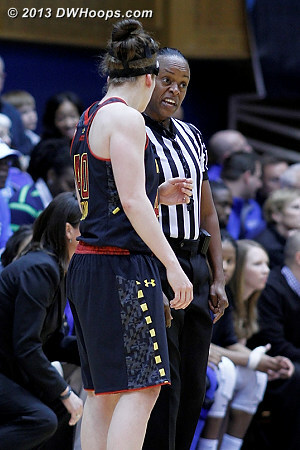 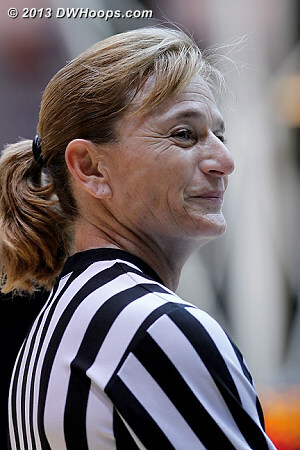 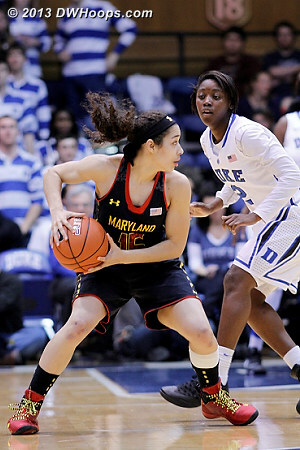 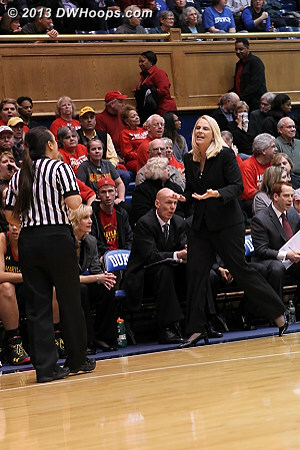 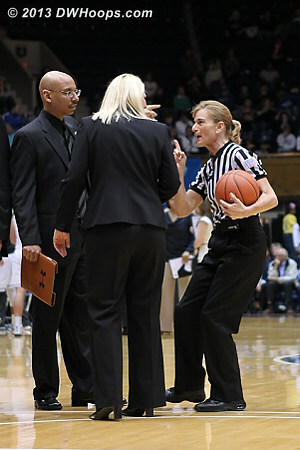 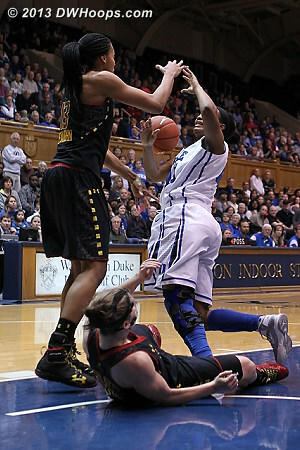 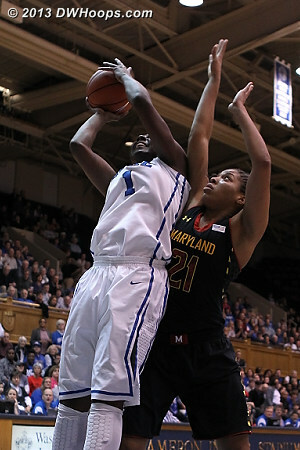 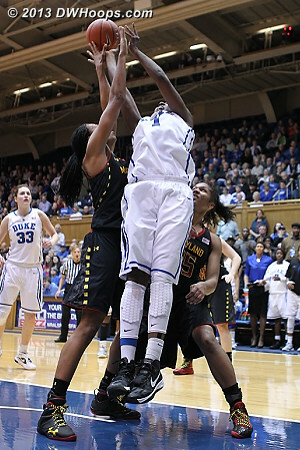 Elizabeth Williams pulls down what Rob Clough called "The Rebound"
Maryland coach Brenda Frese was unhappy with Chelsea Gray cutting off Alyssa Thomas in transition, and her persistent reaction resulted in technical fouls from two different referees and ejection. 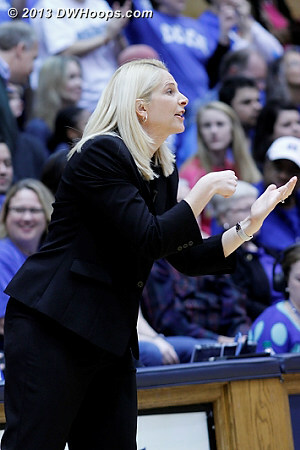 One last glare at Dee Kanter & Co.
Frese: "I am always going to fight for our players, that is obvious." 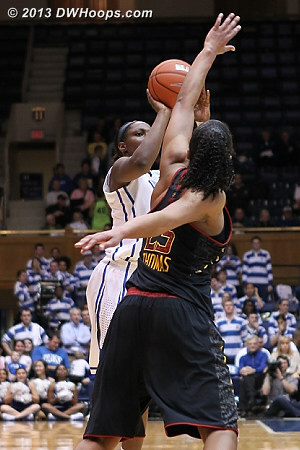 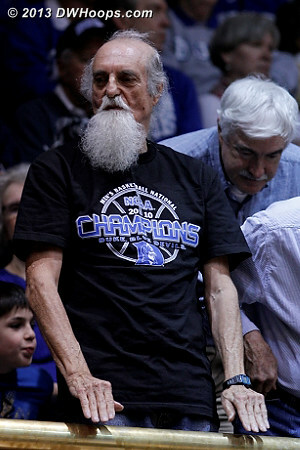 Frese is now 0-10 in Cameron. 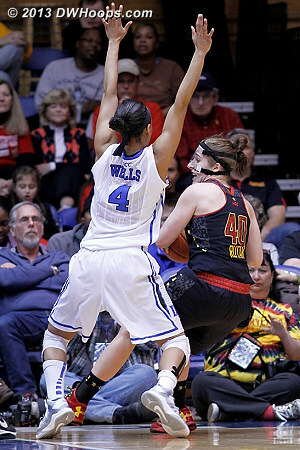 Alyssa Thomas: "It was just an off shooting night, not making shots that that I usually make. 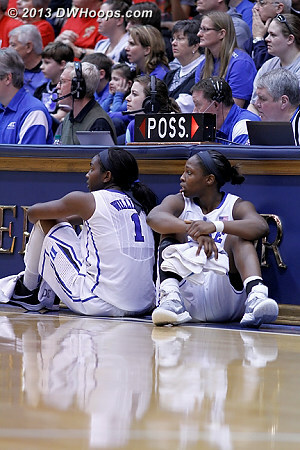 A lot of things would go in and out, but that happens." 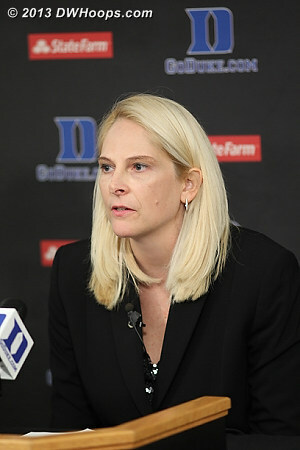 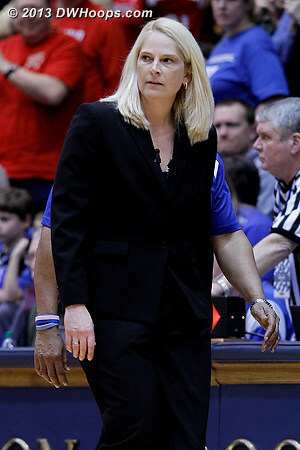 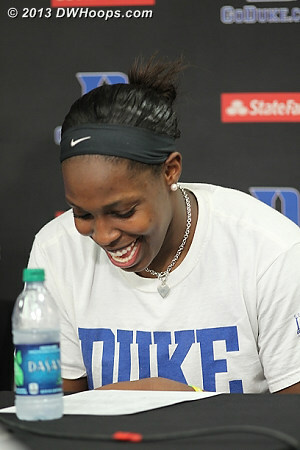 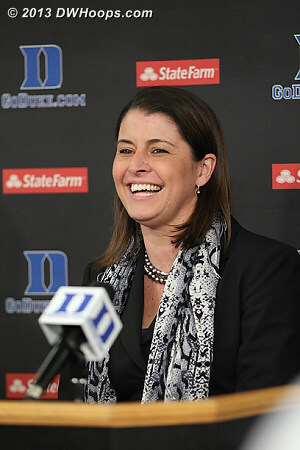 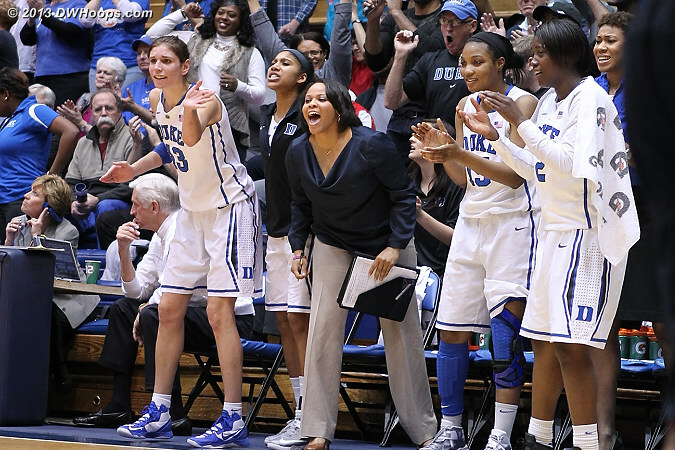 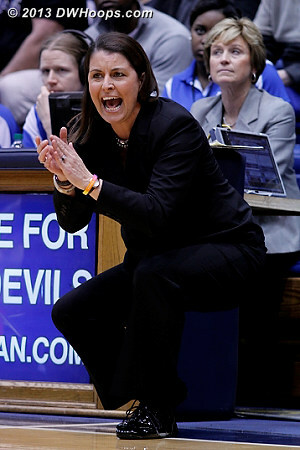 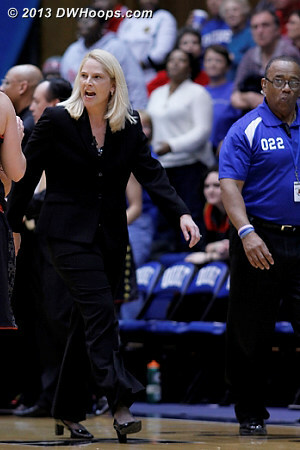 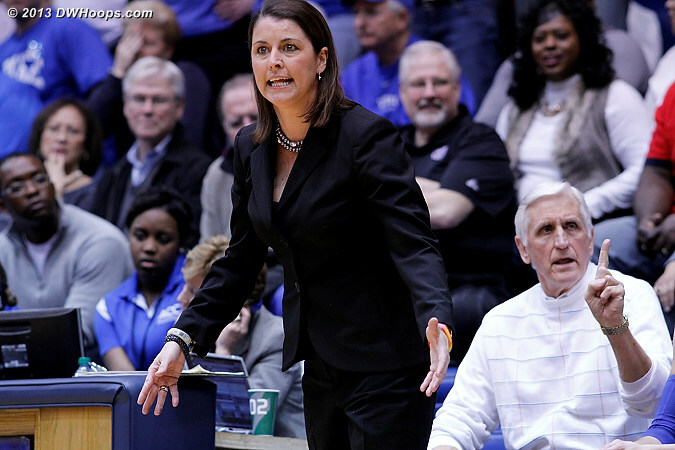 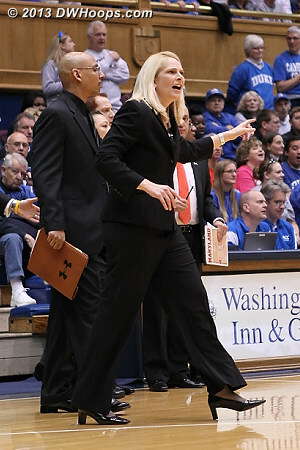 Coach P pleased with Rob Clough's question about how this team reverted to the toughness of her early Duke squads. 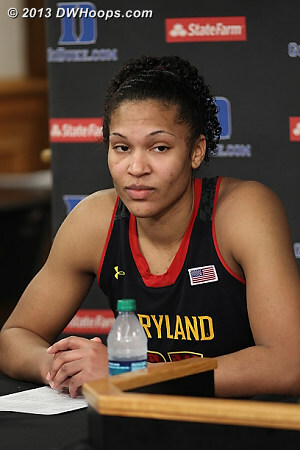 Gray, who scored 28, examines the box score: "I still only had three assists and three rebounds so there is definitely plenty of space to improve"
Liston on Maryland taking the lead: "I think we had to be more aggressive on defense." 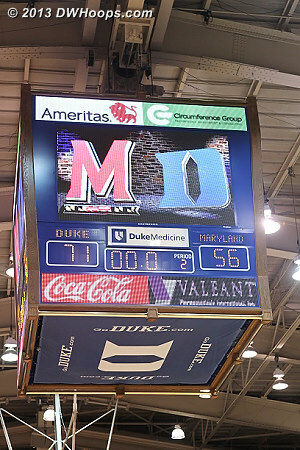 A question from Rob Clough about how Duke could rebound so much better against Maryland than Virginia brought some sharp comments from Coach P, and nervous laughs from the players. 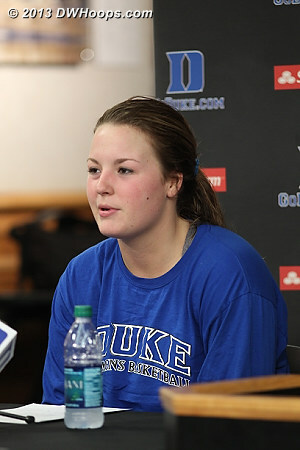 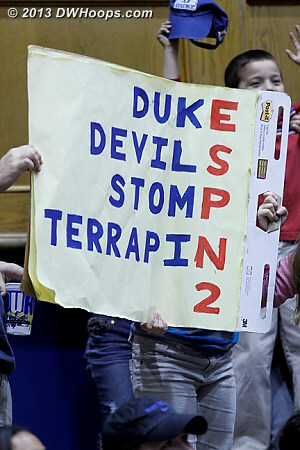 For those with a Duke slant, the press conference was as enjoyable as the game.